Venturina V, Merkel RC, Gipson TA, Manley A, Portugal I. Comparison of methods of evaluating udder health in lactating Alpine does. Journal of Animal Science . 2017;95(Supplement 4). Dolebo AT, Puchala R, Gipson TA, Dawson LJ, Sahlu T, Goetsch AL. Effects of supplemental concentrate level and forage source on intake, digestion, and behavior of growing and yearling Boer goat wethers and evaluation of a method of predicting negative feedstuff associative effects. Journal of Applied Animal Research . 2017;45:470-479. Gipson TA, Clifford-Rathert C. Cohesive behavior of a small herd of goats in a woodland pasture. International Conference on Goats. 2016. Tsukahara Y, Puchala R, Sahlu T, Goetsch AL. Effects of level of brackish water on feed intake, digestion, and heat energy with growing Boer and Spanish goat wethers. International Conference on Goats. 2016. p. 208. 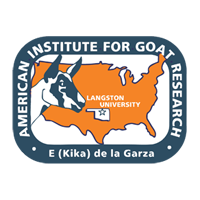 Tsukahara Y, Gipson TA, Hart SP, Dawson LJ, Wang Z, Puchala R, et al.. Progress in resistance to internal parasitism and growth performance of Boer, Kiko, and Spanish goat kids through selection in a central sire test. International Conference on Goats. 2016. p. 131. Mengistu UL, Puchala R, Sahlu T, Gipson TA, Dawson LJ, Goetsch AL. Conditions to evaluate differences in resilience of sheep and goats to high heat load. International Conference on Goats. 2016. p. 216. Guo Y, Wang Z, Zhao J, Goetsch AL, Sahlu T. Preliminary study on anthelmintic potential of methanol extracts of certain plants . International Conference on Goats. 2016. p. 188. Tsukahara Y, Gipson TA, Hart SP, Dawson LJ, Wang Z, Puchala R, et al.. The response to artificial infection with Haemonchus contortus and growth performance of sheep and goat progeny of selected parents in a central performance test . Journal of Animal Science . 2016;94(E-Supplement 5).